The Henck Design office is home base for the burgeoning Philadelphia interior design company specializing in residential home design. The office is located in Graduate Hospital near Fitler Square, which is in the heart of Philadelphia’s long established and thriving neighborhood, South Street West. The area is close to top-rated hotels, with near-by cafes and restaurants in Rittenhouse Square. After Henck Design became the sole occupant of the interior office space, Christina Henck has made an effort to design the office space to suit her and her growing design team. That means free reign to add stylish office decor and home accessories. Really the main goal was to marry office design and home design to create a warm atmosphere to work in. Studies show that warm, inviting atmospheres increase productivity. Everything from furniture, mirrors, and decorative home accessories were chosen with a designer’s eye. That means that there is space for creative pieces like inspiration boards, mood boards, color wheels, rug samples & wallpaper samples. In the Henck Design office consultations are constantly being booked, orders placed & campaigns created. Product is always coming and going and the Henck Design team is always hard at work to keep the company running like a well-oiled design machine. These 4 collages are original artwork by Christina Henck, created for office inspirationIt is very important to Christina to have an office that serves as a source of inspiration for the Henck Design team. Fashion is very important to company culture. The Henck Design team derives much inspiration from fashion designers and magazines like Nylon, Vogue & local magazines like PhiladelphiaStyle. Fashion is the first place we look to for upcoming design trends. 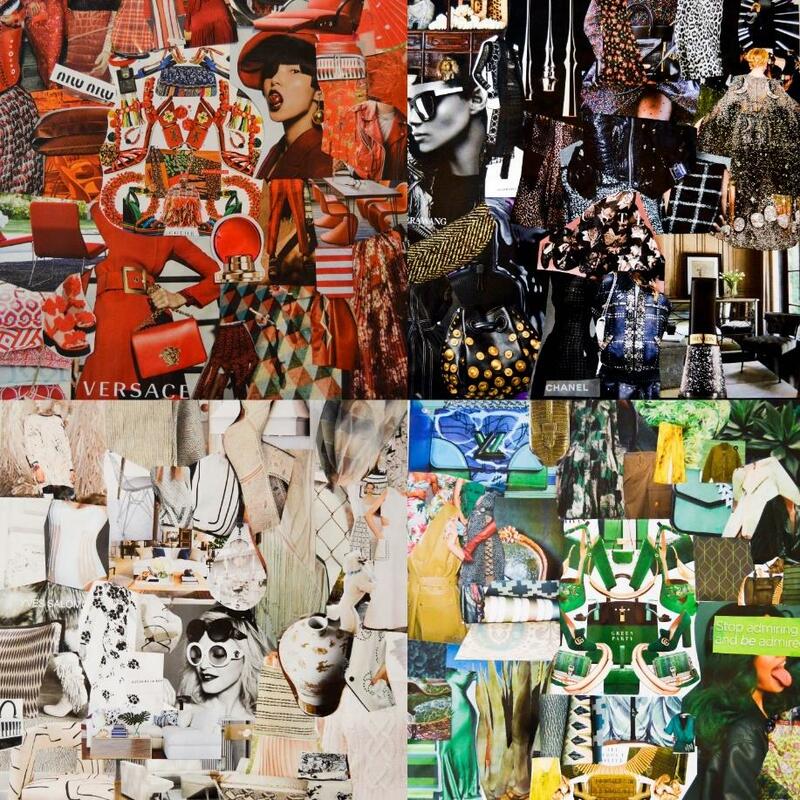 On one of our walls there are color trend boards that Christina created out of some fashion magazines. You can get a closer look at our favorite color trends for 2017 at our Henck Design Color Trends blog series. Accent walls are extremely popular with Henck Design clients and are featured in the Henck Design office as well. 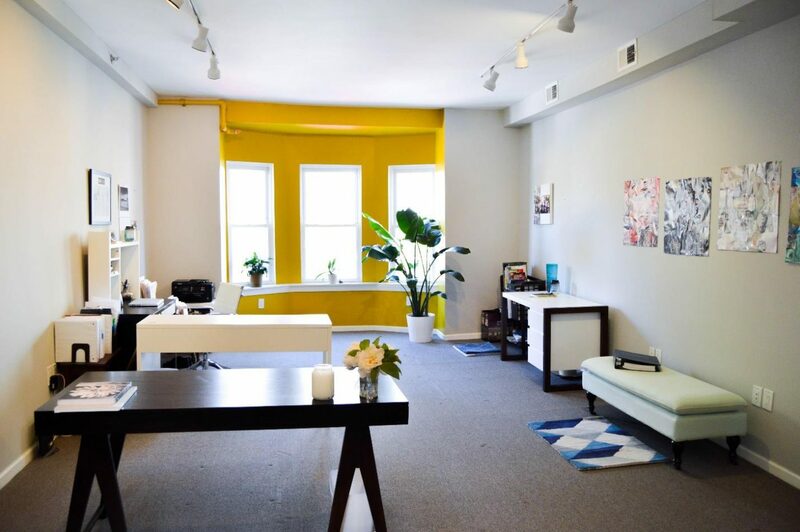 The yellow accent wall in our office brightens up the space & is a great contrast to the light grey walls. It adds an eye catching pop of color that’s noticeable as soon as you come through the door. It’s a conversation starter that receives plenty of compliments. The small lounge of the office serves as meeting place, both casual and professional. The Henck Design team has spent hours brainstorming future campaigns & promotions (that are currently in production!) in this area as well as hosting small get-togethers with friends and colleagues. The black and white chevron rug is always a talking piece. It’s cool & modern, also, did we mention that Henck Design loves color? We generally keep permanent pieces in the office that are colorful. Sporadic pops of color paired with neutrals has a powerful effect on a room and leaves a lasting impression. Those custom fabulous blue wing back chairs totally stand out against the grey walls and pop with black & white pattern rug. On the walls of the office Christina Henck has hung all of Henck Design’s awards and her many magazine articles. 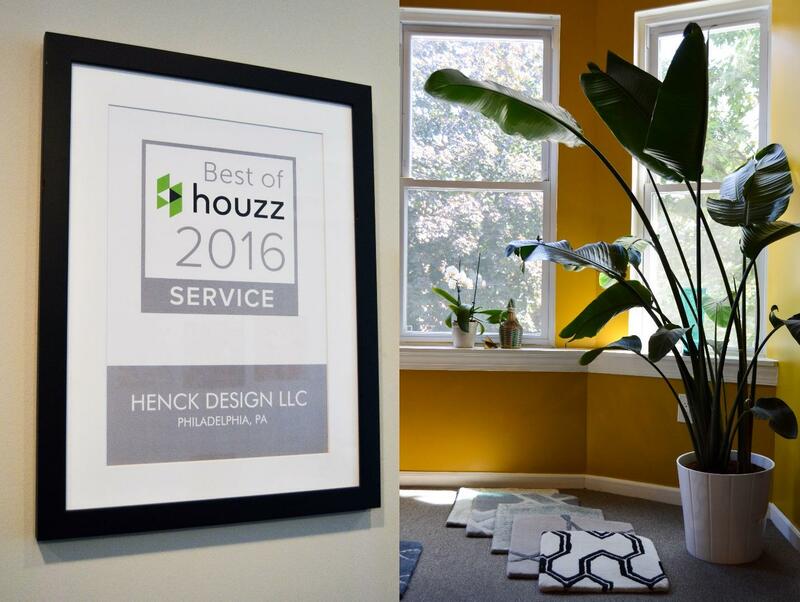 Did you know that Henck Design won Best of Houzz 2016? It’s one of our proudest accomplishments & we keep a framed certificate for it in our office. It serves as a mental reminder of what we’ve accomplished so far & pushes us to accomplish even more. All of Henck Design’s projects and jobs are featured on the Henck Design Houzz page. There are also framed magazine articles from Christina Henck’s interior design column for Row Home magazine. Greenery is desirable in both home design & office design. Aside from being Pantone’s hottest color trend for 2017, it has resurrected the popularity of the common house plant. In an office environment, it is becoming more and more necessary to find little ways to disconnect from technology and reconnect with nature- when you can of course. At Henck Design we rely heavily on technology to function so indoor plants are the perfect touch of greenery for our office space. They fit in window sills, on desks and generally take up little to no unnecessary work space. Candles are an important part of our office decor too. We burn candles every day in the office. Soothing scents help destress the work environment and calm nerves on those particularly stressful days. We love earthy scents like sandalwood, pine needles and evergreen. 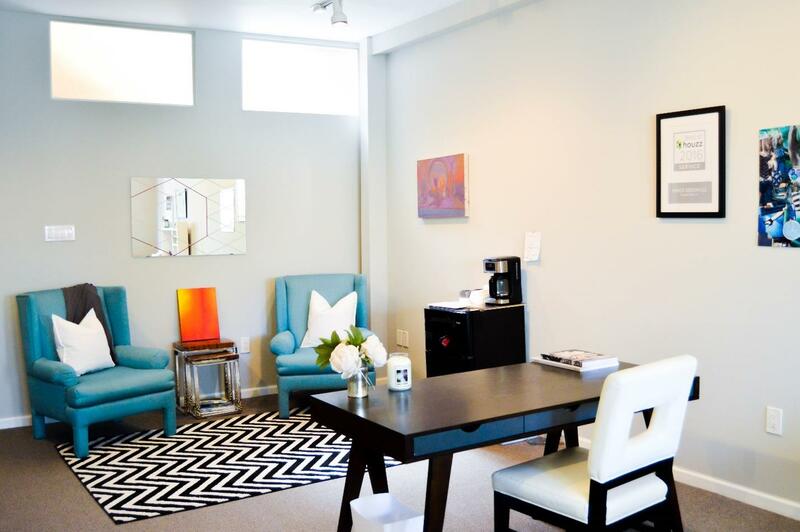 Christina Henck believes strongly in Feng Shui and uses its principles to maintain a restorative, energetic space that is easy to work in, and that sometimes, we don’t want to leave! Christina Henck is going bi-coastal in a brand new effort to create a knock out Feng Shui collaboration, she is connecting with the fabulous Ariel Joseph Towne. There will be more to come and we will keep you posted on Instagram @think_henck on this new Feng Shui collaboration. In the meantime, check out Ariel aka The Feng Shui guy on Dr. Oz. One of the best features of this office is the bay window. On a sunny afternoon we get stunning natural light that keeps the resident bird of paradise and orchid plants quite happy! It’s also great for impromptu work selfies & all of our other office related social media posts and visual content. We love our view of Center City Philadelphia from the Henck Design office. We can see the majority of the skyline from our bay window and we love to take some time out of the day to appreciate the view of our city. Need help with office design or home design? Contact Henck design for more info.